Another Acton football pitch "needs attention"
An Acton resident contacted us this week and asked us to accompany him to Springfield Gardens. Dennis Gallwey walks through Springfield Gardens almost every day. He told us: "The children's playground was moved about a year ago - I believe financed by Thames Water as recompense for the digging up of the park. This was achieved brilliantly and is proving a great success. The playground is well-used and a constant attraction throughout the year." He then took us to look at the mini football pitch. As you can see from the photographs (right) this is virtually unusable. Mr Gallwey told us it was, unsurprisingly, hardly ever used now. "Three years ago, there were team contests here on a regular basis. I also used to see a number of youngsters every day kicking a ball around. But now, very few of them attempt to play." He pointed out that the low level of the ground makes it prone to puddles and a solution needs to be found to make this facility fit for purpose once again. Mr Gallwey added, "I know it's the middle of winter, but this patch needs urgent attention if it is to be playable at all during the year. It needs to be re-turfed and possibly brought to the same level as the surrounding grass. It's not just the puddles, but the fact that there is no grass there at all." 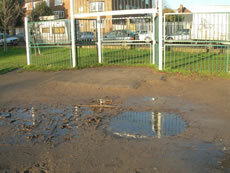 "I noticed on ActonW3.com last week that there are problems in South Acton for young people who want to play football. It seems that is not the only place which needs attention." There are definitely signs in Springfield Gardens that works are starting to repair the parts which were dug up by Thames Water. 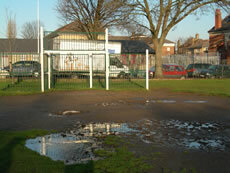 This football facility is not in that area, so we asked Ealing Council for their comments. A Council spokesman said: “While we are onsite carrying out the Thames Water reinstatement works, we will be re-turfing worn areas of the pitch. This work will take place early in the New Year, weather permitting. Officers will be looking at a long-term solution in the New Year through the Acton Central Ward Forum."